For our email Playbooks, we have some advanced sending options so you can fine tune exactly when your emails send to increase the chances they'll be opened! Smart Sending: Using our own data, Drift has defined four windows of times during which recipients are most likely to open emails. These windows are 5:30am-6:30am, 9:30am-10:30am, 1:30pm-2:30pm, and 8:00pm-11:00pm. We will randomly select one of these windows and uniformly pick a time within that window to send the email. They will be sent according to the recipient's timezone if it is known, otherwise we will use the timezone you've set for your Drift instance! Avoid Weekends and holidays: Drift will not send any emails to your prospects on United States Federal Holidays (ex. Christmas) or weekends (Saturday and Sunday). 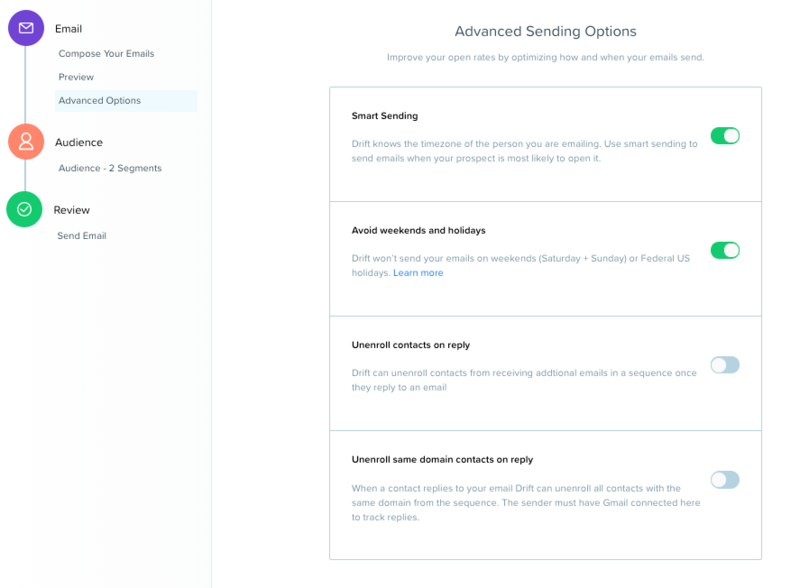 Unenroll contacts on reply: Drift will automatically unenroll those who respond to your email sequence, so that they do not continue to get a sequence once they are engaged. Unenroll same domain contacts on reply: Similar to "Unenroll contacts on reply," this setting will ensure everyone else with the same email domain is unenrolled in order to ensure one point of contact. You must have GMail and have it connected to track replies. Head to your Playbooks tab, and navigate to the Email category. Or, click here! Select any existing Email Playbook or create a new one by selecting New Playbook, Email, and choose any template. 3. Toggle the options you want to use!